An Indian Navy P8I Poseidon conducts a low altitude fly by alongside a U.S. Navy guided-missile during a bilateral anti-submarine warfare exercise with the Indian Navy in the Indian Ocean, April 15, 2019. The Indian and U.S. navies held an anti-submarine warfare exercise involving P-8A Poseidon maritime patrol aircraft and its Indian variant, the P-8I Neptune advanced maritime patrol/anti-submarine warfare aircraft, on April 15 near Diego Garcia in the Indian Ocean. The aircraft were joined by the Arleigh Burke-class guided-missile destroyer USS Spruance (DDG 111). The military exercise focused on anti-submarine warfare training, information sharing, and coordination between maritime patrol aircraft and surface combatants. It was the first bilateral anti-submarine warfare exercise since the signing of a Communications, Compatibility and Security Agreement (COMCASA) last September that enable closer interoperation between U.S. and Indian military assets. COMCASA allows the U.S. military to transfer secure communications and data equipment to India. Prior to the conclusion of the agreement, the United States had to remove advanced communication equipment from all military platforms sold to India such as the P-8I Neptune. Additionally, the United States had to place less secure temporary systems on Indian units so the two sides could communicate during bilateral exercises. Indian and U.S. forces set up their first-ever secure communication link earlier this month. The P-8A aircraft participating in the drill are from Patrol Squadron (VP) 8 “Fighting Tigers,” based in Jacksonville, Florida, while the Indian Navy P-8I aircraft is with Naval Air Squadron 312 based at Indian Naval Station Rajali in southern India. The P-8A/I is the military variant of Boeing’s Next-Generation 737-800 commercial aircraft and thought to be one of the world’s most advanced anti-submarine warfare aircraft currently in service. Notably, the Indian version of the aircraft includes the Telephonics APS-143 OceanEye aft radar system and a cutting-edge magnetic anomaly detector not installed on U.S. Navy P-8A aircraft. The Indian Navy’s first P-8I squadron was stood up at Rajali in November 2015. 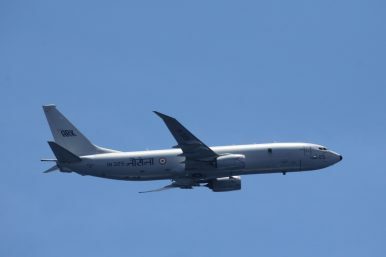 As of April 2019, the Indian Navy operates its entire fleet of eight P-8I maritime patrol aircraft from Rajali. In 2016, India placed a follow-on order for four additional P-8Is with deliveries slated to begin in 2020. The U.S. Navy has awarded U.S. aircraft maker Boeing a $2.4 billion production contract for the next batch of 19 P-8A Poseidon maritime patrol aircraft this January. What is the state of India's relationship with Seychelles really?